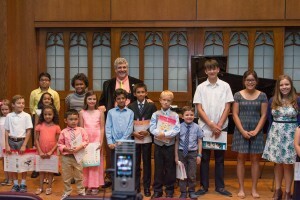 At KeyNotes Piano Studio, we recognize that not all students are the same, and that every student requires a unique approach. That is why our tuition structure is based on a range guided by many factors. Beginning students with no prior history of study are usually placed in 30 minute lessons each week. Students who have advanced into master levels may take an hour or more. The types and complexity of music, the levels and approaches to theory, and the lesson planning involved for a more advanced student require a different approach from the instructor. Additionally, some students may also face particular difficulties or need specialized techniques. Because there is no single approach to teaching that will satisfy every student’s needs, and each student will require a different amount of the instructor’s time, skills, and experience, there can be no one price for lessons. And because we believe that music study needs to be done with a teacher and student who meet each others’ needs and personality, the introductory evaluation is always free. If you study with an instructor at KeyNotes and find that instructor is not a good fit, we encourage you to find another instructor. It is vital that your relationship with your music instructor be a good one. You should look forward to seeing her or him each week. Lessons at KeyNotes start at $100 a month. KeyNotes does not charge by the lesson, but by the month. This means that a month with five (5) lesson days in it will be the same price as one with four (4). But $90 is just a part of a range. For some students, the price of lessons is higher according to their level and needs. Regardless, tuition includes access to master classes, competitions, recitals in professional venues, all other KeyNotes activities and services throughout the year. Tuition is competitive with other area studios and extra curricular activities, and students in need of financial help have the option of applying for scholarships. Contact me any time. Tuition will be prorated if you join after the current term begins, or if you begin lessons part way through the month. It is our policy not to charge any registration fees. We accept multiple forms of payment for tuition, including checks and credit cards. Payment plans available. paying. Additionally, our tuition rates remain the same, regardless of how many years the student remains enrolled, unless longer lessons are deemed appropriate. At KeyNotes, students are not merely numbers on a page. They are not the tuition they pay. Each student is a unique individual with specific and, to us, important needs. Please speak to your instructor about tuition if you have questions. We will be more than happy to help in every way we can. Your music education is our greatest goal. My Students Are My Passion. Contact me today, and I will show you.